During AL-KO’S Toughest Tow Test, the tow tugs copped just as much dirt and grime as the caravans. Our Hema tow vehicle – the Map Patrol Toyota LandCruiser 76 Series wagon – which travelled all the way from Brisbane and back again – copped it worse than most. As our designated recovery vehicle, and part-time tow vehicle, it spent a week down and dirty in the Victorian High Country, and needed a good spruce up before we sent it back to Hema – if we had any chance of getting our hands on it again! We’d taken a Karcher K5 Premium Full Control Car & Home high pressure washer along for just this reason and, somehow, the job of car detailing fell to me! The K5 was easy to assemble and only took me a few minutes, without having to refer to instructions (phew!). The High Country grunge and muck fell away under its high-pressure flow. It boasts a 2.1kW water-cooled motor which pumps out a flow rate of 8L per minute. And it also comprises an integrated water filter to protect the pump from dirt particles. Its operation is pretty straightforward, which I appreciated. It’s highlighted by the Full Control trigger gun. I just regulated the pressure by twisting the Vario Power spray lance until the desired level was shown via a LED display. The trigger gun has three pressure settings and a detergent setting to ensure the optimal calibration for every surface. And switching from high pressure to the detergent mode can be done without changing the spray lance. I was also impressed with the practical coiling of the hose reel, meaning the pressure hose can always be stored neatly. 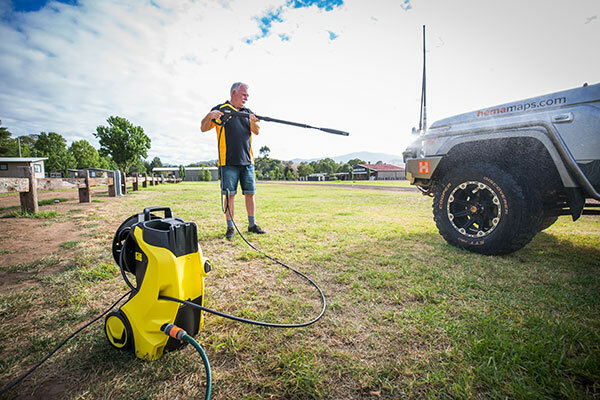 And yet another intelligent feature of the Karcher high pressure washer is its user-friendly Plug ‘n’ Clean, allowing quick, easy and convenient application and replacing of detergents. You can even check the filling level at a glance. Karcher says the detergents increase efficiency and help protect and care for the surface being cleaned. Well, they certainly worked a treat on the LC76. It was sparkling by the time I’d finished with it! The 13kg unit also comprises a completely retractable, high quality aluminium telescopic handle. It’s height-adjustable so you can move the device around at a comfortable pulling height. And the Karcher comes with a raft of cleaning/washing products accessories, including a home kit with Surface Cleaner T 350 and a litre of the three-in-one Stone Cleaner. An additional car kit for thorough vehicle cleaning includes a foam jet, rotating wash brush, drying cloth and one litre of Car Shampoo. 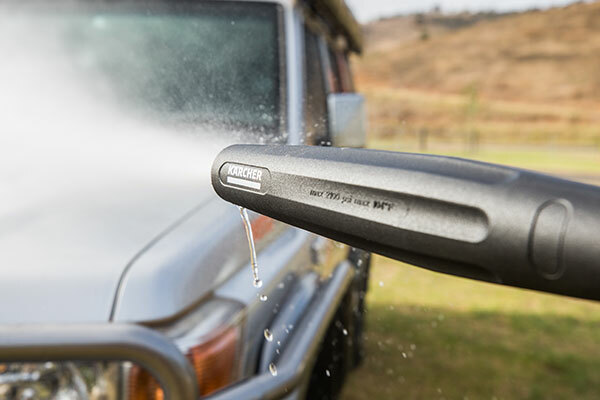 The accessories can be connected effortlessly to the high pressure washer via a simple bayonet system. Once I’d given the Hema tow-tug its well-deserved ‘spit and polish’, I conveniently stored the trigger gun and spray lance on the Karcher. The experience had inadvertently provided me with an invaluable lesson: I’ll never, ever rely on the humble garden hose when it comes to cleaning my own vehicle again! The full product test appeared in Caravan World #564. Subscribe today for the latest caravan reviews and news every month!